Nothing good comes out of betrayal. Nothing. But maybe it does push people to show their true colors and make difficult decisions that were always in the lingering background of one’s mind. One can’t argue that affairs are ever cut and dry. Black and white. What I can argue is that Sarah Rayner is a very talented writer. 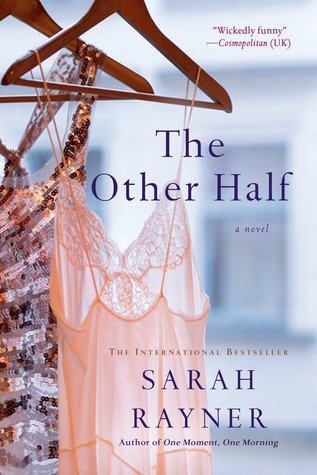 What made this different from any love triangle/affair book I have read was the honest look into both sides of the affair and deep, raw emotions from each of the characters. Anger, guilt, desire, excitement, insecurity, despair are just a few of the emotions a reader will feel during this brief glimpse into strangers’ lives. The dual points of view between Maggie (the wife) and Chloe (the mistress) take this story to another level. Here are two strong, intelligent and loving women who are hoping for lasting love in the wrong man. Immediately, one would think poorly of the mistress and deem the wife as “the victim”. But learning some background about Maggie and how she and James came to be married and parents, questions the strength of their marital foundation. The same goes for immediately labeling Chloe as “the home wrecker”. Unless Jamie expressed the sentiments “No, I am happily married”, the affair would have never started or continued. Aside from the emotional rollercoaster you feel for each of the main characters, I felt that Rayner did a beautiful job incorporating well developed secondary characters. They were equally involved giving sound advice and support which made the story feel real and not “created” for drama sake. As I was getting closer to the end of the book, I was worried and anxious to see how Rayner would play this story out. This is a challenging review because I don’t want to say too much. Some books need to be experienced as is. All in all, I felt she wrote it perfectly and left me feeling satisfied knowing where the characters were heading with their lives. This was the first book I read by Sarah Rayner but definitely not the last. *Thank you to NetGalley and St. Martin’s Griffin for the advance, uncorrected digital galley. I was not compensated or required to review this title. To learn more about Sarah Rayner, her books and upcoming events, please visit her site here. Tags: adultery, Contemporary Fiction, Contemporary Romance, dual POV, women's literature. Bookmark the permalink.